This Hebrew Tattoo is pretty fresh, just came across it last week. The victim was going for a biblical reference "God of my Salvation", straight from Isaiah 12:2. "God of my Salvation" - El Yshuati in Hebrew, are two words. Do you see two words in this tattoo? Right. This is not the end of it, though. The letter Tav in Yshuati was somehow switched for a He. The letter Vav (the U sound) looks almost like a Resh. It's all a big mess. 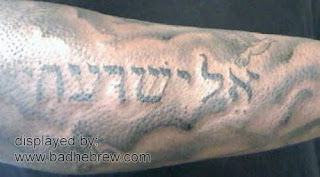 Now why this Hebrew tattoo went wrong, I have no idea. It's a biblical verse, for god's sake! You can find correct references very easily. If you can't tell the difference between this and the victim's rendition, you should think twice before inking it on. I mean it!